Translation: Shiori Saito, his own concept. 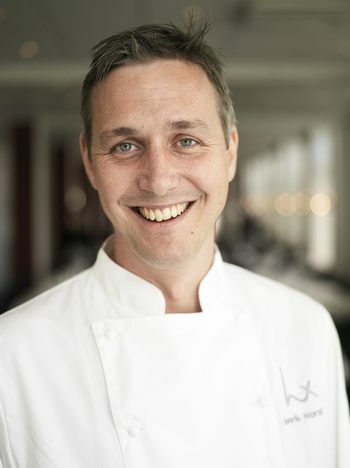 Still open to other culinary influences, his vision is based in the Swedish flavors. For him, the most important thing is to be supplied on each season from local producers. It is all about to get the raw materials closer the better. He works mostly in the area of Mälaren Valley, a big lake that spans 120 kilometers from east to west in opposite direction to the Baltic entrance. In 2010, Henrik published his first book “Mitt Nära Kök” (My Close Kitchen), a nice inspirational document that delves into his cuisine, with great photography, which reveals Henrik´s farmers and local producers within their natural environment. Why you decided this location? Actually we just drive throughout this house and it was empty. That was before they build this area, it was over these factory buildings left here, just the ground, behind us. They had this plan to build new apartments in the area so it is a bit off of the city but still in the city, so I think it was perfect, because when we started in 2003 we wanted to do a Swedish kitchen, which follows the season so I wanted the nature just outside the door, not in the city, so you can feel the difference. So this was a perfect spot and when I saw the house it was just like “yes, here is gonna be, it´s the perfect location for the restaurant”. How do you think combine with the culinary experience itself? For me it is perfect because when you are sitting in the terrace, next to the water, eating the summer menu it´s summer outside and during the wintertime all the lake is ice here and snow so from the main room you can see the winter outside so all that enhance your experience. How is the Culinary School sector in Sweden? I have working experience. I don´t think school is so good here. For me it is old fashion school. There is not like a reference in new cuisine. How do you select your menu according to the seasonal products? I work on the season with local farmers, fishermen so the closer the producers, fresher products you get. I try to work in this mälardalen, the big lake we have in front of us. In this area you have a lot of small farmers. Smaller producer that actually I know so I have dialogue with them. How could you describe your work? Locally produced fresh products with a Swedish taste. There is room to specific raw material imports? I import some from Finland, Norway and Denmark but the majority comes from this region. Do you like to refer to LUX as Swedish cuisine or the term Scandinavian cousin may be appropriate? You can say Scandinavia too. I think Danish, Norwegian and Swedish are quite similar. We have the same products. How could you synthesize the core of the Swedish cuisine? It has some differences, like for instance in Gothenborg they have a great port. But it is characteristic both, sea products and from the forest. We have a sort of wild leaves from the forest. How do you balance the influence and inspiration from abroad? Yes of course, I travel a lot in Europe so I get inspiration from France, Spain, UK. But I always use these Swedish flavors. My kitchen consists in salt, sweetness, sour and spices, for me these are the typical Swedish flavors. According to this global inspiration. What kind of influences are a major attraction for you? My inspiration from France come in how they use the local products. In France is common only have the wine from the region. Achievements that you are really happy about so far. Last summer we rebuild the dinning room. The idea was bring out part of there kitchen, where you do the last touch for our guests. So it is possible to have a dialogue with the guest as well. Instead of standing on the kitchen, you go out to the dinning room. After that, we got two vey good reviews to biggest Swedish newspaper, getting a 6 of 6 and 5 of 5 in their rankings. Then we got two awards, including DN’s Golden Dragon Award in the luxury restaurant category. Henrik Norström on his persona side, how do you manage during your spare time, do you like to prepare food for your guests or perhaps it is the other way around? I cook a lot. Here in the restaurant is more about control, maybe do the final touch but I don’t cook so much here. I enjoy when I have to cook or preparing food. It is in a different way, with friends or the family, yes. Any restaurants you enjoyed lately? I went to London, it was a Chinese restaurant, Yauatcha. It is one star Michelin restaurant. I liked a lot, because the atmosphere, well the food too. Quite similar to Swedish because they also work with the sweet & sour, so it is similar, not the same products but you can understand the taste.